There are times when we need a little something extra special for breakfast or brunch. It could be house guests or holidays or simply a celebration of a simple life in which a change is needed. These maple bacon scones fit that special meal need perfectly. These are impressive little pastries full of richness and flavor. They will delight everyone at your table. Even better for the cook is that they are actually quite easy to whip up. They are delicious the next day so don't be afraid to make ahead. For the best flavor, use the best possible ingredients. These simple scones are truly the sum of their individual parts. Real butter, not margarine or vegetable shortening. Real maple syrup the kind that comes from a tree not the darkly colored and artificially flavored corn syrup. I know, expensive, but in this case worth it and these are not things to eat every day. The bacon, too, is of extreme importance. 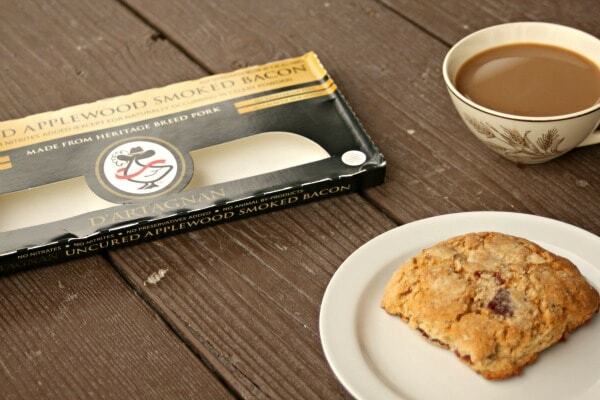 I chose an applewood smoked bacon to compliment the maple flavor. Choose bacon full of flavor and without antibiotics or nitrites and nitrates. That kind of bacon can be hard to find, I know. While local is always my first choice, there are times when mail-order can come in handy. Enter D’Artagnan, a mail-order food company that provides high quality meat and pantry supplies (truffle butter, anyone?). They focus on humane farming practices, heritage breeds, and food production methods that use all natural ingredients without preservatives. 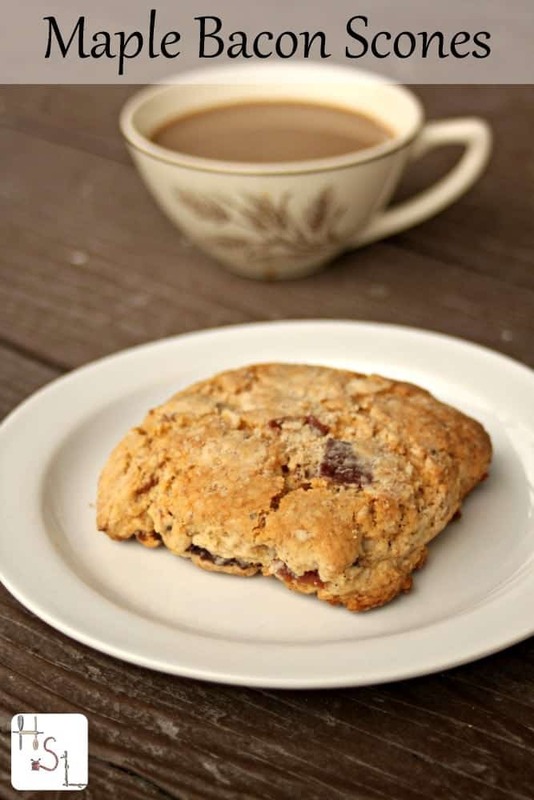 Whip up an impressive and easy breakfast with these maple bacon scones. Whisk together the maple syrup and milk. Set aside. Whisk together the flours and baking powder. Add the butter, using a pastry blender or fingertips to mix together. Cut the butter into the flour until it crumbly. Add the cooled and crumbled bacon. Pour in the maple syrup mixture and mix well. Turn the dough out onto a floured board and knead just until it comes together. Place the dough onto prepared baking sheet. Pat the dough into a disk about 1/2 inch thick. Cut the dough into individual scones and separate just slightly. Bake in preheated oven for 22-25 minutes or until golden brown. Cook wire racks. Store excess in airtight containers. Want to give D’Artagnan a try? I'm so very excited to bring you the chance to win a shopping spree. Scroll down to enter.